Everyone from Disney to Bloomberg to AMC is launching education platforms--but the results have been mixed. 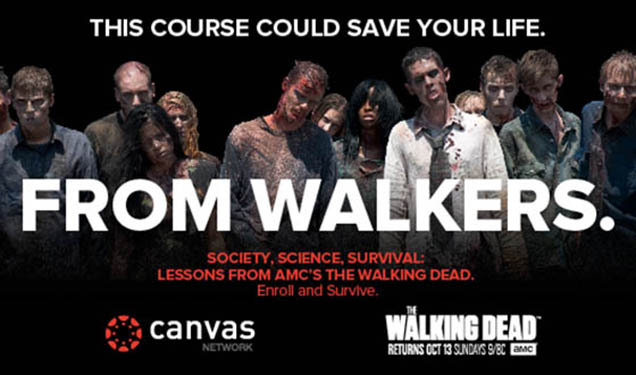 Soon, you’ll be able to learn zombie apocalypse survival skills from AMC’s The Walking Dead. The University of California at Irvine is offering an eight-week online course in partnership with the series. AMC isn’t the first media company to push into education. At least two dozen others have tried before. They won’t be the last, either. Forbes and Atlantic Media, which owns The Atlantic, are also gearing-up to launch online learning programs. Most media companies getting into education wind up learning some hard lessons themselves: Education is a very different business from media. And succeeding takes a lot more than having a well-known brand, built-in audience and high-quality content. It’s no secret that “traditional” publishers and broadcasters are scrambling to find new ways to make money beyond subscriptions and advertising. One increasingly common (yet largely unnoticed) way that many of the biggest, best-known, most-respected media owners are doing that is by launching educational programs featuring their brands, content and talent. The list is a who’s who in entertainment (Discovery, Disney, PBS, Condé Nast, Elle, and Angry Birds), business information (Bloomberg, Businessweek, CFO Publishing, UBM, F+W Media, The Financial Times, and Harvard Business Publishing) and the news media (NBC News, The New York Times, The Washington Post, BBC, The Economist, The Guardian, The Telegraph, Die Zeit, and News Corp). Even “new media” brands like travel blog Matador and millennial careers site the Muse are doing it. So as long as media companies have brands and content that engage learners (along with their readers or viewers), you should expect to see more of this kind of thing. One caveat: It’s a pretty big leap from informing or entertaining people to educating them. Only a handful of these initiatives (most notably News Corp.’s Amplify) have turned into meaningful, lasting businesses, but usually only after substantial investments or acquisitions. More commonly, they end up shut down after their corporate parents lose patience—such as Disney’s K-12 education business, Bloomberg Businessweek EDGE and the New York Times Knowledge Network, for instance. A handful, such as Bloomberg’s and The Economist’s, get a second chance to pivot and look for firmer footing. Most, however, just plod along. For starters, even though the target audiences for media companies’ educational programs are often existing readers or viewers, those same people have different motivations when it comes to learning. They need more than just news, information or entertainment. They want tangible, in-demand, career-enhancing skills. That isn’t really what most newspapers, magazines or TV shows provide, though. Meanwhile, massive open online courses (“MOOCs”) have signed-up 5 million people so far, at least half of them working professionals, not students. And career-focused education start-ups that most people have probably never heard of—PluralSight, Lynda, SkillShare, Treehouse, Grovo and General Assembly, to name just a few—are generating real revenues and growing fast. Meeting those different customer needs is a problem for media companies because creating and delivering compelling, effective learning is not the same thing as producing engaging articles or entertaining videos. It demands new capabilities outside traditional, media-oriented editorial, production or design skills, such as lesson planning, instructional design and assessment along with complicated, unfamiliar new technologies. Those things aren’t easy to put together well, even for experienced educators with plenty of money. They’re especially hard because people’s behaviors are evolving just as fast as the technology. But the challenge of figuring out that alchemy is compounded even further for media people because education also requires some new and very different ways of thinking and working. Learning, for example, depends on deep, thoughtful interactions like coaching, collaboration and debates. But to publishers and broadcasters, meaningful social engagement is defined by simple likes, sharing or comments. It might be the golden age of social media, but education requires both capabilities and mindsets rarely found in organizations built for much wider broadcast and distribution. The big struggle for most media executives, though, is the business side of education. So far, for one thing, the non-accredited, direct-to-consumer education market (where most of them play) just isn’t very big. MOOC platform, Coursera, for example, may have attracted more than 4.5 million students, but it only generates $200,000 a month in revenues. Granted, that is growing quickly, but for now, outside of technology and design courses, the real money is still in selling to companies, schools and other organizations. The problem is, marketing lessons, courses and certificate programs is not like selling advertising or subscriptions. It requires developing relationships and credibility with new customers, such as human resources, school officials, professors and government bureaucracies. The sales cycles are longer and the adoption processes more convoluted and political. And the price points are not only much more expensive than subscriptions, they’re usually much smaller than the six or seven-figure ad deals big media companies aim for. The good news is he’s not the only one who thinks so. Several big, global brands—including AT&T, Bank of America, Cisco, GE, Google, HSBC, and IBM—are now sponsoring educational content. The bad news is many of these experiments are being done in partnerships with universities and new-era education and technology startups like Khan Academy, Instructure, Udacity, and Betaworks, not media companies. Whatever the right formula might be, media companies are going to keep trying. But there’s a steep learning curve and the future of education is still very uncertain. So if they want to play it smart (like AMC, Forbes, and The Atlantic have been about reinventing their core businesses), they’ll need to adapt their mindsets and business models, not just their content. Todd Tauber heads business development at Nomadic Learning, a leadership-education startup. He previously co-founded The Economist's education division.